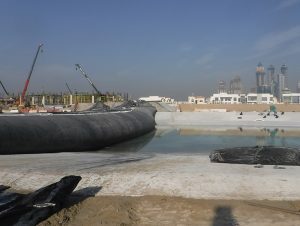 Water-filled Cofferdams for Construction Applications - AquaDam Inc.
A cofferdam is a structure, usually temporary, used to isolate a submerged work area — either to contain turbidity or allow for dewatering of the submerged work area. 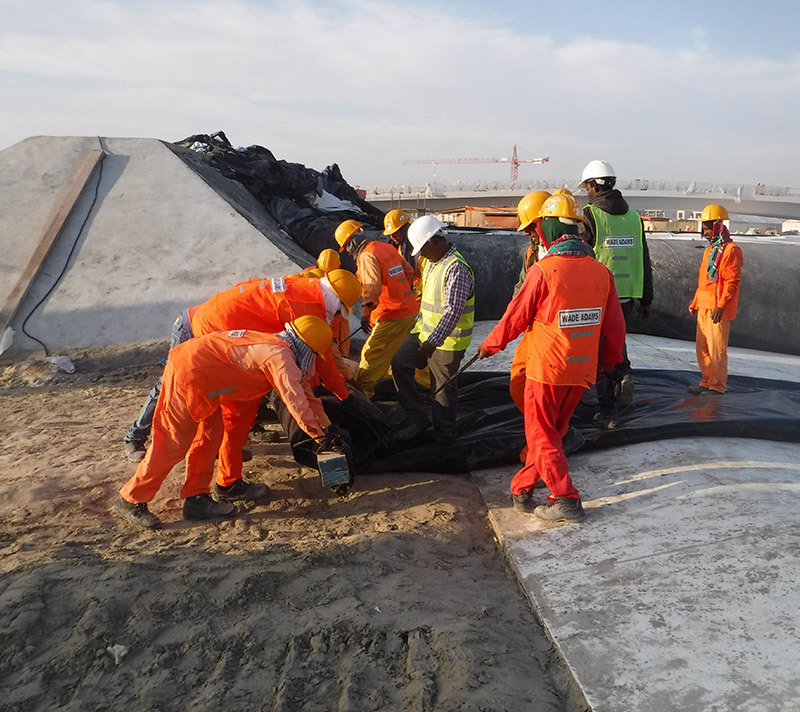 After dewatering, work can be done in dry conditions, which improves the quality of the work while reducing costs. Cofferdams can be critical for a wide variety of construction projects. 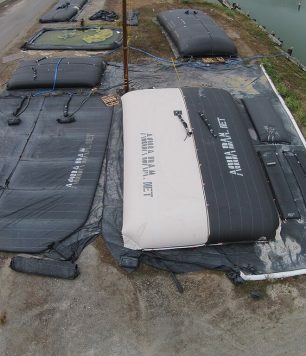 You may need cofferdams to control sediment discharges from a submerged excavation or dredging area. 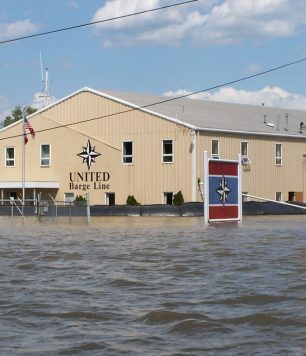 You might also need water barriers for dewatering purposes. Dewatering is the process of removing water from an isolated, submerged space, resulting in a dry work area. While many different arrangements of cofferdam design exist, three main types are used today: steel sheet pile, earth or gravel filled, and water-filled. Steel sheet pile installation is slow and noisy. It has a high environmental impact from noise and vibration pollution and is restricted from installation in areas with low overhead — like underneath bridges. Additionally, seepage rates can be quite high, and the cofferdam will not settle into boils in the ground beneath it. Dirt- or Rock-filled cofferdam installation is slow and expensive and results in turbidity plumes in the body of water that negatively impact the aquatic environment. Water-filled cofferdams — on the other hand — are usually quick to install, using the on-site water as fill material. No turbidity or noise and vibration pollution issues are associated with its installation. While earth-fill cofferdams are associated with potentially contaminated turbidity discharges, the same cannot be said about the AquaDam. Made with virgin-resin high-grade polyethylene and polypropylene, the AquaDam has virtually no negative environmental impact resulting from installation, use, or removal. When you’re looking for a water-filled cofferdam that will get the job done, look no further than the AquaDam. 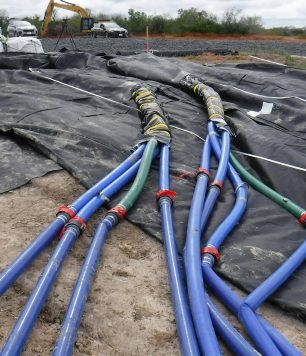 The AquaDam is a water-filled cofferdam that is typically more effective, quicker and cleaner to install, with minimal environmental impact compared with traditional alternatives The AquaDam consists of two flexible water-tight tubes, side-by-side within a larger outer woven sleeve. When filled with water, the AquaDam provides water depth control up to its rated maximum. 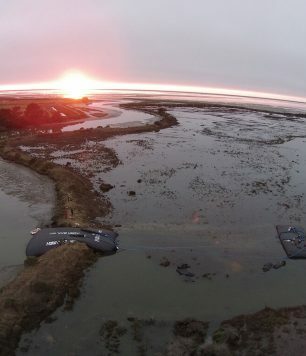 Site conditions may reduce the effective controllable mud/water depth of an AquaDam. Taller/Longer is usually better. The AquaDam water-filled cofferdam system has a significant edge over other types of water-filled barriers. The side-by-side arrangement of inner tubes within the outer sleeve is inherently stable when full. In addition, AquaDams are constructed with an integrated stability baffle that further increases the stability of the dam, especially during installation. The AquaDam is able to be turned to follow nearly any required path alignment, so that a single unit may be used to form a cofferdam with turns in it. AquaDams are manufactured using a patented method of tube-in-sleeve construction, which results in a lightweight but durable water-filled cofferdam. They can be manufactured up to 1,200’ long as a single unit, and our patented connection collar allows multiple units to be connected to form any required length. To determine if the AquaDam is suitable for your site, please fill out our contact form, chat, or email. How Does the AquaDam Work? 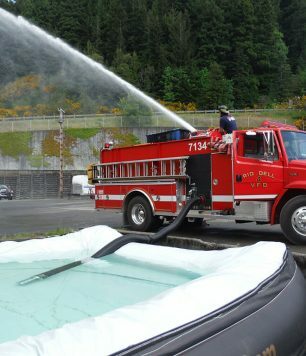 To use the AquaDam, simply unroll the first 20 feet down the starting bank, begin adding water and let the water do the work of unrolling the rest of the dam. The AquaDam can be guided through turns using ropes, eliminating the need for additional units if a change in cofferdam direction is needed. Once the dam is full, it is capable of controlling differential water depths. This allows the work area to be dewatered to ground level, with water depth on the other side of the AquaDam. Not only is this installation process dramatically less expensive than getting enough sandbags, earth, gravel or steel to fulfill the same purpose, but you will also enjoy a serious reduction in labor costs and effort expended during installation. Only four to six workers and one piece of equipment are typically needed to handle an AquaDam during installation. However, larger dams do require additional people and equipment. Removing the AquaDam when the job is done is nearly as simple. Bring the work area water level up to the same level as the greater body of water, pump water out of the AquaDam until it is floating and then roll the dam up in place, or pull the dam — from the closed end — up the bank and out of the body of the water. Once at least 20 feet of the dam is on shore, it can start being rolled up for transport off-site. Reuse is possible in most situations but is not guaranteed. The AquaDam must be placed so that it (and the soil it sits on) is not affected by excavation activities in the work area. 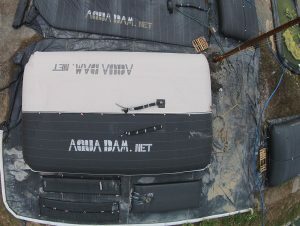 AquaDams are vulnerable to vandalism. Installation in high-population areas mandates the use of a 24 hour security guard to discourage curious people with knives. The AquaDam is considered full when it reaches its design height as measured at the lowest point along its path. Continuing to fill the dam past this point will not result in much additional height or control capacity; the dam is likely to burst if over-filled. Overtopping is not achievable with a typical AquaDam. ADI does not supply water filled barriers with overtopping as a capability. Smaller “fuse” dams can be placed to wash out if water levels threaten to exceed the controllable water depth of the primary AquaDam. AquaDams may be reusable under the right circumstances; reusability is possible but not guaranteed. Periodic maintenance pumping may be required to maintain AquaDam height. To get started using an AquaDam temporary cofferdam for your construction project, you’ll first need to determine the maximum mud and water level to be controlled over the lifetime of the project and select an AquaDam that provides more rated control depth than what you anticipate is needed. A larger dam is always better — Mother Nature does not always conform to the engineers assumptions. To learn more or get a free quote on an AquaDam for your next construction project, fill out our online contact form, call us at 1-800-682-9283 or click to chat today.